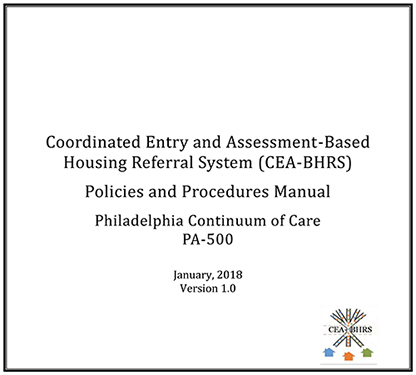 Philadelphia’s Coordinated Entry and Assessment-Based Housing Referral System – or “CEA-BHRS” (pronounced sea-breeze) – is a process designed to coordinate program participant access, assessment, and referrals to homeless assistance services and housing. CEA-BHRS shifts the focus from a strategy that says “Should we accept this household into our program?” to one that says “What housing /service assistance is best for each household and quickly ends their housing crisis permanently?” While Implementing CEA-BHRS alone does not increase housing, services, or other resources, the CEA-BHRS process helps ensure resources in the homeless system are used as effectively as possible. What does CEA-BHRS mean for Philadelphia? Quality and effectiveness of the CEA-BHRS process is evaluated at least annually through feedback from participating projects and households. All shelter, transitional housing, rapid re-housing, and permanent supportive housing projects receiving funding from the Continuum of Care (CoC) Program, Emergency Solutions Grant (ESG) Program, or the City of Philadelphia Office of Homeless Services (OHS) are required to participate in CEA-BHRS. As the CEA-BHRS process rolls out, please check this website often to access CEA-BHRS materials and to register for trainings. All CEA-BHRS Trainings are listed on the training calendar. To register for trainings, please click on the link of the training you’d like to attend in the calendar. This webinar leads shelter providers through the new CEA-BHRS process, highlighting key policies and procedures that impact their work. We ask case managers, housing specialists, supervisors, program directors at OHS-funded emergency shelter programs to attend this webinar. 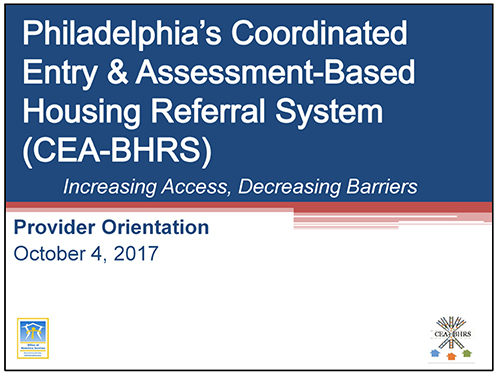 Shelter case managers, housing specialists, and supervisors will learn how to access and enter CEA-BHRS housing assessments into HMIS during these in-person trainings. HMIS users have to attend this training before they are able to access the CEA-BHRS Housing Assessment workflow in HMIS. This is an in-person train-the-trainer session designed for 1-2 “Master Assessors” from each EH singles provider organization. Trainees will practice how to use the VI-SPDAT triage tool, which is an integral part of the CEA-BHRS Housing Assessment. Master Assessors will bring back to their staff tips and tricks for ensuring that the VI-SPDAT best reflects the needs and vulnerabilities of their participants. This webinar is for TH/RRH/PSH providers that are required to fill housing vacancies through the CEA-BHRS process, highlighting key policies and procedures that impact their work. This is an in-person HMIS training for the staff at TH/RRH/PSH projects that will enter vacancy information and receive referrals through HMIS.